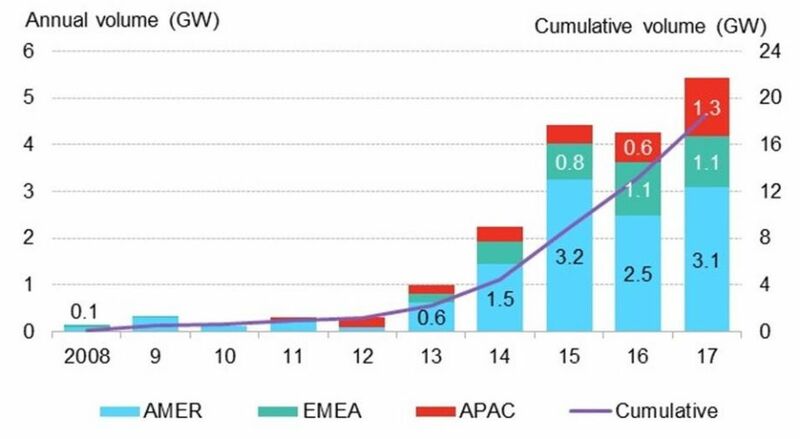 Despite looming policy uncertainty in the two most active markets, corporations globally purchased 5.4 gigawatts of clean power through long-term contracts, surpassing 2015s record. Source: Bloomberg New Energy Finance. Note: Onsite PPAs not included. APAC number is an estimate. Pre-market reform Mexico PPAs are not included. These figures are subject to change and may be updated as more information is made available. Source: Bloomberg New Energy Finance, Bloomberg Terminal, The Climate Group. Note: Electricity demand is reported from FY2016. Several small RE100 companies have not disclosed annual electricity consumption.